You may have heard would-be body culturists say, “Aw gee, how can I train? There is no gymnasium around here, and any way if there was, I couldn’t afford it.” Actually, hundreds of young men have presented this problem to me, hoping that I would be able to solve the little difficulty for them. It is quite natural for any person to consider exercise and a gymnasium at the same time. As I have said at different times, it depends on what you are after. If it is games or calisthenics, all right. By all means become a member of a gymnastic class. They will certainly teach you to become good at the game you prefer, and this will help to keep you healthy and fit at the same time. Calisthenics will freshen you up and keep you normally fit, but if it is your whole body you want to build up to a stage of perfection, then it is an entirely different proposition. Of course, there are exercise rooms in all gymnasiums to which you can go and seclude yourself, but they do not always have the proper apparatus at hand for the body culturist to use. Of course, there is always the congeniality of companionship, but I have found that this is often very embarrassing, especially to the man who is under developed or too fat. There is always somebody willing to pass remarks, which even when made in fun, go a long way to diminish enthusiasm. Often a man is too conscious of his condition, and what he requires is encouragement, not to made the object of fun no matter how good natured it may be. In the world of modern fitness, more and more people are opting to take their gym efforts into their own home. As equipment gets cheaper, it’s getting a lot easier to get your hands on it, and a lot of people are taking advantage of it. Of course, though, knowing what to use in your home gym can be very hard. You will have limited space for this project, and you will have to choose options which can do more than one job. So, to help you out, this post is going to be exploring all of the little elements you need to build your own home gym. When we think about going to the gym it’s usually accompanied by thoughts of money. For example, how much money does a gym subscription cost, how many months do you plan to go for, is it sustainable, or would it be better to get your own gym equipment? Unless you’re loaded with money and you have the room to support a home gym, then chances are you’re probably thinking about giving it up because you simply don’t have the funds to support your fitness goals. This is simply a defeatist attitude. Let’s face it, you’re not buying expensive equipment just to get a good workout, you’re getting it for the sake of convenience and to have an investment that will motivate you. When you spend hundreds on something like a treadmill and you don’t use it, you’re going to be constantly reminded of the hefty amount of money you paid for it and you’re more likely to use it based on that fact alone. Sigmund Klein and the invention of Leg Curl? Home is where the heart is. So if you have a passion for living a healthy and happy lifestyle, your home is the perfect venue to lay those foundations. Looking for something to break the monotony of dumbbell and barbell training? Admit it, every once and a while you like to try something new. Exercises or machines that truly test you. Well today, we’re going to look at the Swingbell, an old school piece of bodybuilding equipment promoted by York during the heyday of the 1950s. In today’s post we’ll discuss some of the exercises you can do with this retro piece of equipment along with some tips to make your own. Today’s post comes from Kellie Davis and the good folks at Health Perch. Highly recommended you check them out! Long commutes, expensive membership fees, and bad weather are just a few excuses that stall a regular workout routine. Consistent exercise promotes better health, improved energy, and a positive mood, so why not create a space for exercise where it’s most convenient: at home. 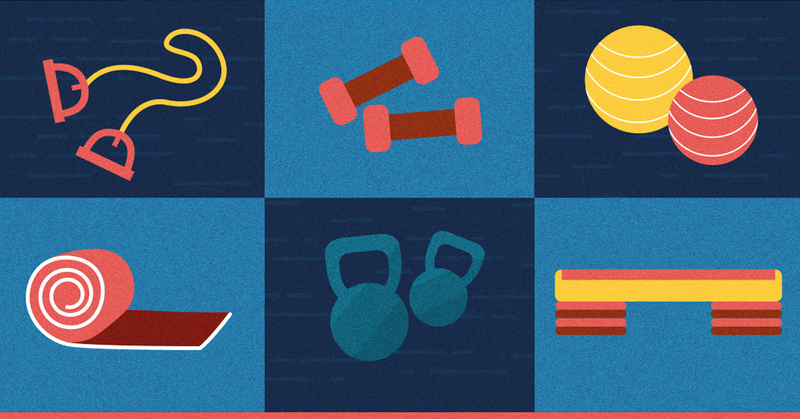 Though elaborate at-home gyms sound dreamy, these budget-friendly ideas are sure to keep a body moving without breaking the bank. Home gym equipment doesn’t have to be bulky. Build a killer routine using items that stow away under beds, pack in bags, are portable around the home, and can be crafted using items found at the hardware store.